Power Factor Correction (also known as PFC) is one of those product technologies that is often overlooked when it comes to energy saving. The nearer an electrical load’s power factor is to Unity (1) the better the power factor and the more efficient the system. Sites with poor power factors and/or inductive motor loads can also incur reactive power charges from their electricity provider if they are on half-hourly metering. The power used by electrical loads is measured in the rate at which they use energy. The measurement unit is Watts (W). For large numbers power usage may be written as kilowatts (kW), Megawatts (MW) or Gigawatts (GW). We also term the amount of power an electrical or electronic device uses as the ‘Real Power’ used. Another popular power-related term when it comes to electrical loads and uninterruptible power supplies is ‘Apparent Power’. This is calculated by multiplying the Voltage of the mains power supply by the Amperage drawn to give a VA rating (for larger numbers kVA or MVA). 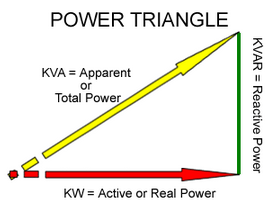 When we look at Power Factor what we are examining is the relationship between the Real and Apparent Power. To calculate the Power Factor we divide the Watts by the VA = Wattts/VA = pF. The nearer Power Factor is to Unity, the greater the electrical efficiency as the curves for Real and Apparent Power are in-phase (overlap). When we look at energy usage, what we are measuring is the amount of fuel used over a specific time period. For electricity companies, the energy provided is measured in kilowatt-hours (kWh). Any building meter whether it is a data centre, industrial plant, office or home has an electricity meter (or meters) and this will record the total number of kilowatt-hours used during the day and night. For most companies, their electricity bill simply covers the energy used. For companies with half-hourly meters, the electricity bill can also include a charge for Reactive Power (kVAR). It is mandatory in the UK for sites with a peak-load above 100kW to have installed half-hourly (HH) meters. In connection to this requirement, it is also mandatory to appoint a Meter Operator (MOP) and Data Collector (DC). The HH Meter Operator installs and maintains the electricity meters and the necessary communications and monitoring equipment that provides the consumption data to the Data Collector. The Data Collector is responsible for collecting the half-hourly data from the meter, validating this and then passing on to the supplier for invoicing. Both of these services, can be provided an electricity supplier or third party energy company. For half-hourly metered customers, their electricity bills can include charges for both energy usage and Reactive Power charges. When assessing electricity usage, Power Factor plays an important role. The number helps us to assess how efficiently energy is being used on a site and by an electrical or electronic system. Power Factor is the ratio between Current and Voltage waveforms. For most loads the Current waveform lags the Voltage waveform. The difference between the two waveforms is the ratio known as Power Factor. The closer the PF ratio is to Unity, the more efficient the electrical load. Why does this matter? Well within any building or complex, there will be a mix of electrical and electronic loads, systems and devices. Each will have their own Power Factors, amalgamating to a total site Power Factor at the building incomer. The load mix could include: inductive loads (cooling, heating, lighting, motors, compressors and ballast) and capacitive loads (IT and telecoms). Within the inductive loads (motors, compressors and lighting ballast) will be an element of Reactive Power. This is the energy used to generate and sustain their magnetic fields and is a consequence of simply having the systems energized. This Reactive Power is non-working power that the electricity companies have to supply and charge. The Reactive Power charges some half-hourly metered sites with a high number of inductive loads can be high. Improving the site Power Factor and thereby reducing the Reactive Power (KVAR) number, reduces the charges and the overall electricity bill. This is the role of Power Factor Correction Systems. PFC systems contain electrolytic capacitors. The systems are sized based on the load site power factor without active PFC systems in place and the desired site Power Factor required. The built-in capacitors act as reactive current generators to offset the kVAR produced by the inductive loads. A site may have more than one PFC system installed and there may be one installed per electrical supply phase. The system is installed as close to the main distribution board as possible and generally within a plant room. A Power Factor Correction system is installed in parallel rather than in series to the mains power supply. This means that a system or capacitor failure will not be detrimental to loads; the Reactive Power KVAR charges will simply rise. PFC systems are not a fit and forget item however. They do require annual inspection and maintenance and capacitors will require replacement during their working life. 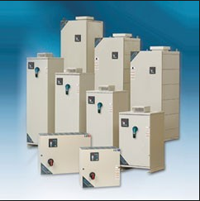 Power Factor Correction systems do help to reduce costs and save energy. The payback period and Return on Investment (ROI) can be short (within 2-3 years) but this is dependent upon the level of Reactive Power charges incurred prior to installation. With regular maintenance a PFC system can have a working lifespan of 15 years or more. Whilst PFC systems are more commonly associated with industrial sites, there can be a need for them within data centre environments and especially those where the site power factor is not close to Unity. For more information on our ICAR Power Factor Correction systems call us on 0800 210 0088. We provide a free of charge energy survey along with replacement capacitors and maintenance plans for existing PFC systems.